Xiaomi has been silent about the existence of Mi A2, but the smartphone has been appearing on the web every now and then. 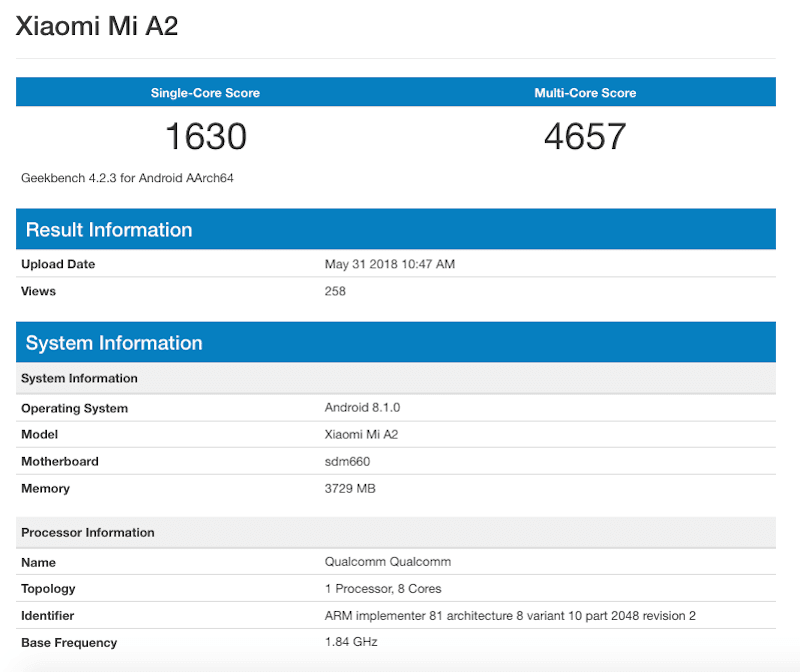 After confirming its presence via a certification site, the Mi A2 has now paid a visit to benchmark portal Geekbench, which further confirms that Xiaomi will indeed be rebranding the Mi 6X as Mi A2 for international markets. There are countless rumours on the web hinting at the Mi 6X will be rebranded as Mi A2, but Xiaomi has allegedly said that there’s no smartphone with Mi A2 moniker at the moment. As per the Geekbench listing, the Mi A2 will be powered by the Snapdragon 660 chipset, clubbed with 4GB of RAM and the device was running Android 8.1 Oreo during the time of running the benchmark. The smartphone achieved a single-core score of 1630 and a multi-core score of 4657. These scores are below par when compared to other Snapdragon 660 SoC smartphones such as the Nokia 7 Plus and even the Mi 6X. The Mi 6X managed to score over 5500 multi-core score and so does the Nokia 7 Plus. These scores are more or less equal to what the Redmi Note 5 Pro achieved with the Snapdragon 636 SoC. In fact, the Note 5 Pro achieved a score of around 5000 every time in Geekbench. This is surprising, but maybe the device could be running an early version of Android 8.1 Oreo. The Mi A2 is expected to be the successor of Xiaomi Mi A1, the company’s sole Android One smartphone to date. Being an Android One device, the smartphone will run a clean version of Android 8.1 Oreo, same as the Mi A1. The Xiaomi Mi 6X in China arrived with a 5.99-inch Full HD+ display on the front, Snapdragon 660 chip inside, up to 6GB of RAM, dual rear cameras of a primary 20MP sensor and a 20MP camera on the front is also present on the smartphone. The only downside with the device is the 3010mAh battery. Nope, there’s one more downside: Lack of 3.5mm headphone jack. Battery life is great !!!! !Dont worry about that!!!! !4-6 Hours of screen on time depending upon usage!!!!! That’s 636 scores, and not 660 sadly. 660 gives over 5.8k in multi core score on geekbench as this is an underclocked processor. I hope MIUI on Redmi Note 5 Pro after MIUI 10 brings optimized properly!!!! !4GB Ram and Processor is not utilized properly in my honest opinionn!!!!! Chinese version. Actually has Snapdragon 660!!!!! I’m surprised! Yes it’s the same phone! GSMArena says MiA2 (Mi 6X). No card slot, no 3.5mm jack, 3000mah battery lol. Why surprised? Like last year it will be this year!!!! !